The challenge of rebuilding after both an earthquake and a tsunami in Chile. It was the worst disaster Chile had suffered in half a century, not only a strong earthquake but a tsunami too. Two million people were affected. Caritas’s emergency response began immediately: its strong local networks helping it reach the most vulnerable people in the most remote areas, often more rapidly than the government could. While Caritas Internationalis launched an appeal for $13 million, 250 parishes and 1,500 churches in the disaster area began distributing relief. 4,000 tons of aid, from food and water to tents and clothing, reached 800,000 people. Emotional support was extended to comfort those traumatised. The 27 February was indeed a dark day for Chileans. 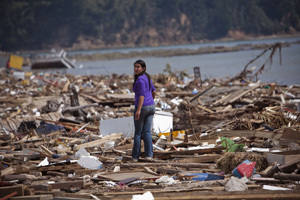 The twin natural disasters revealed the “cracks in our development process and the inequalities which exist” said Caritas Chile President Bishop Manuel Camilo Vial. Despite its good economic growth, Chile has wide disparities and now its government says an extra half a million more people are deemed to be poor. Caritas bore this very much in mind when it began reconstruction programmes in June. Assistance is targeted towards exceptionally poor families, with the focus firmly on community involvement and skills training. Take house building: most beneficiaries actively participate in constructing their new homes and due to the help of specialist technicians they will now be able to work on construction themselves. So far, 235 new houses have been built and nearly 600 repaired. Juana Carrillo, from the village of Curanilahue, is proud of her new two-bedroom wooden home. “Receiving the keys to our own house is a great joy for us, even greater when you consider that this help has come from so far away,” she said. The same rules of sustainability and empowerment have been crucial in Caritas’programmes to stimulate economic regeneration. Communities that were despairing and immobilised have been trained in starting and keeping a business going, with a strong emphasis on diversifying sources of income. More than 600 small family businesses are being nurtured, the aim being that in the event of another natural disaster resilience is spread through a community which does not rely on just farming or fishing.